The Land surface Data Toolkit (LDT v7.2) – a data fusion environment for land data assimilation systems The Land surface Data Toolkit (LDT v7.2) Kristi R. Arsenault et al. The effective applications of land surface models (LSMs) and hydrologic models pose a varied set of data input and processing needs, ranging from ensuring consistency checks to more derived data processing and analytics. This article describes the development of the Land surface Data Toolkit (LDT), which is an integrated framework designed specifically for processing input data to execute LSMs and hydrological models. LDT not only serves as a preprocessor to the NASA Land Information System (LIS), which is an integrated framework designed for multi-model LSM simulations and data assimilation (DA) integrations, but also as a land-surface-based observation and DA input processor. It offers a variety of user options and inputs to processing datasets for use within LIS and stand-alone models. The LDT design facilitates the use of common data formats and conventions. 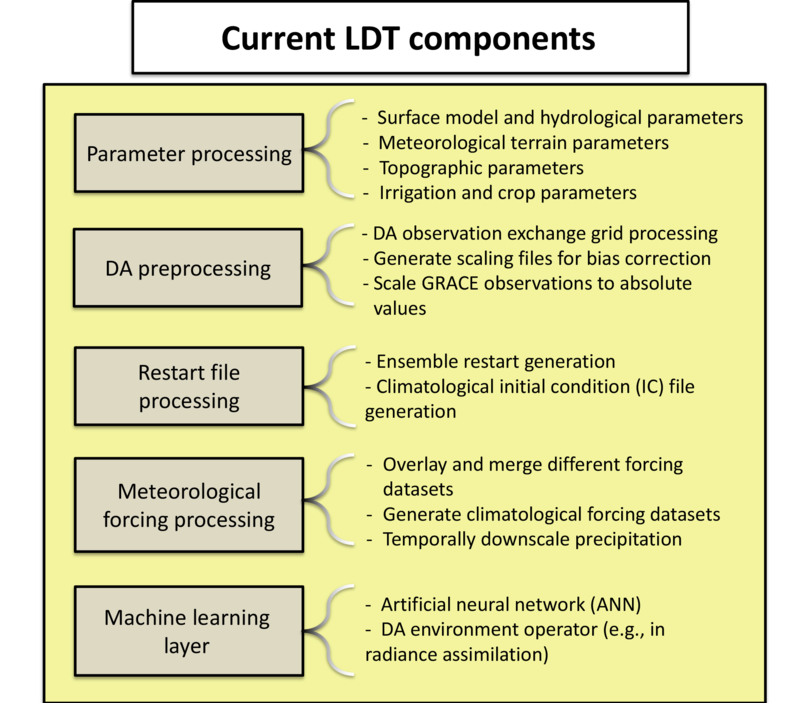 LDT is also capable of processing LSM initial conditions and meteorological boundary conditions and ensuring data quality for inputs to LSMs and DA routines. The machine learning layer in LDT facilitates the use of modern data science algorithms for developing data-driven predictive models. Through the use of an object-oriented framework design, LDT provides extensible features for the continued development of support for different types of observational datasets and data analytics algorithms to aid land surface modeling and data assimilation. Arsenault, K. R., Kumar, S. V., Geiger, J. V., Wang, S., Kemp, E., Mocko, D. M., Beaudoing, H. K., Getirana, A., Navari, M., Li, B., Jacob, J., Wegiel, J., and Peters-Lidard, C. D.: The Land surface Data Toolkit (LDT v7.2) – a data fusion environment for land data assimilation systems, Geosci. Model Dev., 11, 3605-3621, https://doi.org/10.5194/gmd-11-3605-2018, 2018. The accurate quantification of terrestrial water and energy cycles is important for a wide range of applications including weather and climate modeling and initialization, agricultural and water management and estimation of hydrological hazards such as droughts and floods, among others. The need for robust estimates of land surface conditions to support these applications has led to the development of land data assimilation systems (LDASs; e.g., Rodell et al., 2004; Mitchell et al., 2004; Chen et al., 2007). The key emphasis of an LDAS is the integration of the state-of-the art land surface models (LSMs) with high-quality observations from in situ networks, reanalyses, and remote sensing, in order to obtain an improved representation of land surface processes. The synthesis of several types of model and observation data across various spatial and temporal resolutions and extents is needed to support the development of flexible LDAS configurations for conducting both research and application-oriented studies. The LDAS environments pose a varied set of data synthesis requirements based on the modeling configurations. The models within LDASs are typically executed in an uncoupled fashion by isolating the land surface and by providing the required boundary conditions from the atmosphere. These conditions are derived from the outputs of atmospheric models, remote sensing, and ground observations. The LSMs also require specifications of land surface characteristics such as vegetation, soils, and topography, which are a mix of both time-invariant and time-varying parameters. The data assimilation (DA) tools in LDASs incorporate the information from remote sensing and ground observations to constrain and improve model states. Similarly, the optimization, and uncertainty estimation tools exploit observational information to calibrate and estimate the uncertainty associated with the model parameters. In addition to these external data needs, data processing requirements related to initialization, spatial and temporal disaggregation, and bias mitigation are also often encountered in LDAS modeling scenarios. Finally, there is often a significant technology gap to bridge when bringing together the technical advances in data science and processing methods with the land modeling approaches. These challenges and gaps have motivated the development of a data fusion environment known as the Land surface Data Toolkit (LDT). The primary function of LDT is to serve as a data synthesis environment for terrestrial LDASs. LDT is currently designed as the preprocessor to the NASA Land Information System (LIS; Kumar et al., 2006; Peters-Lidard et al., 2007), which is an open-source software infrastructure for land surface modeling and designed to facilitate the efficient utilization of terrestrial hydrological observations. In addition to the land surface models, LIS includes computational subsystems for DA, optimization, and uncertainty estimation. LDT and LIS have been used to enable LDAS configurations over global (GLDAS; e.g., Rodell et al., 2004), North American (NLDAS; Mitchell et al., 2004; Xia et al., 2012), and regional (e.g., FEWS NET LDAS (FLDAS); McNally et al., 2017) domains. The development of LDT provides a formal environment to support the data synthesis requirements of the LIS-enabled LDAS instances. Specifically, LDT supports the processing of the model parameters, forcing data, and initial conditions in a consistent manner and meets the DA-related data preprocessing requirements, i.e., the climatological processing of datasets needed for model simulations and the use of advanced data science techniques for data mining and fusion. The latest public release of LDT is version 7.2 and available at https://lis.gsfc.nasa.gov/releases (last access: 6 May 2017). The need for formal and efficient data fusion environments to augment modeling systems has been recognized in the model–data fusion (MDF; Raupach et al., 2005) paradigm, which describes the iterative nature of model development and the critical data dependencies and information transfer in the modeling process. The LIS framework has been designed to support this interplay between models and data through both internal and external components. The internal LIS subsystems for DA, optimization, and uncertainty estimation allow the exploitation of the information from hydrological datasets for improving model structure, parameters, and states. A post-processing environment known as the Land surface Verification Toolkit (LVT; Kumar et al., 2012) provides the capabilities for the verification, benchmarking, and evaluation of LIS and other independent model simulations and a wide range of observational datasets. Together with LIS and LVT, the development of LDT allows the capabilities for realizing the end-to-end MDF paradigm through formal environments that allow for input data processing, mining, and fusion and also model characterization, formulation, and validation. This paper provides a detailed technical description of LDT, its capabilities and applications, highlighting its use as both a stand-alone application and within the overall LIS framework. Section 2 gives additional background and a review of land model input processing software. Sections 3 and 4 describe LDT's overall design and variety of capabilities it currently supports. Several examples of some of the capabilities are provided in parts of Sect. 4. Finally, a summary and description of future work are contained in Sect. 5. There are a few instances of specialized data processing environments designed to support large modeling systems. One example includes the Community Land Model, versions 4 and higher (Oleson et al., 2010), which has data preprocessing scripts and online instructions provided to users to generate inputs for the model. The developers provide standardized global input files, but if the user wants to run another resolution or regional subset or use different parameters (e.g., a land cover map), the user must modify and run several different scripts to generate the necessary input files, which can take several steps. Other examples include the National Center for Atmospheric Research (NCAR) WRF Preprocessing System (WPS) and the preprocessor for the WRF Hydrological modeling extension (WRF-Hydro; Gochis et al., 2014; Sampson and Gochis, 2015). WPS offers a suite of specific datasets and primarily serves the preprocessing needs of the WRF community (Skamarock et al., 2008) and some in the Noah land surface model community (e.g., Chen et al., 2007). If the user wants to use WPS for Noah model parameter preprocessing, the user is either limited to what preprocessed parameters are available or they have to generate those files in the specific WPS-required format before using them. The WRF-Hydro preprocessor can utilize different hydrologically based topographical datasets, such as HydroSHEDS (Lehner et al., 2008); however, the input elevation maps to the WRF-Hydro preprocessor are expected to be specifically in ArcGIS raster format, a proprietary format (ESRI, 2016), and may require more testing and effort when using open-source alternatives, like QGIS (https://www.qgis.org/, last access: 15 August 2017). Figure 1Schematic of the complete model–data fusion (MDF) paradigm enabled by LDT, LIS, and LVT (modeled after Fig. 1 in Williams et al., 2009). LDT is the data preprocessing environment that feeds into the modeling and data assimilation environment of LIS and also LVT (the model evaluation and benchmarking system). Meteorological boundary conditions used in the numerical simulation of land surface states and fluxes are required, in many instances, to be downscaled and/or adjusted to the surface level as inputs to the land models. Some forcing data preprocessing efforts currently exist to downscale coarser-scale datasets, e.g., climate model reanalyses in high varying terrain-based regions. Examples include the Modern-Era Retrospective analysis for Research and Applications (MERRA) Spatial Downscaling for Hydrology tool (MSDH; Sen Gupta and Tarboton, 2016), which uses the R statistical software package (e.g., https://cran.r-project.org/, last access: 30 May 2018); TopoSCALE, v.1.0 (Fiddes and Gruber, 2014); and the eartH2Observe data portal, which provides a suite of Python scripts that downscale meteorological fields from the European Union's eartH2Observe dataset (https://github.com/earth2observe/downscaling-tools, last access: 18 January 2018). However, these script-based or software toolkits typically only serve a select set of different meteorological forcing datasets. LDT shares some commonality with these processing tools, but it is designed to be a more generic and comprehensive environment for supporting a wider range of data processing needs for the land and hydrological modeling communities. It provides the user with many data processing options in how datasets are generated onto a common projection and grid, reducing inconsistencies and errors, especially when combining different parameter datasets. 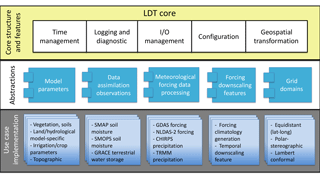 LDT uniquely supports the handling of a suite of land remote-sensing measurements and preprocessing requirements for data assimilation environments. In addition to these key functionalities, LDT can generate certain model initial conditions (e.g., climatologically averaged state fields) for deterministic and ensemble model runs, a capability that is often needed in routine model simulations. Furthermore, the software is enhanced with advanced techniques such as the development of data-driven models based on machine learning (ML) techniques and Bayesian merging for adaptive downscaling and bias-correction methods. LDT can handle input datasets in their “native” formats, performs consistency checks to ensure reasonable values (e.g., no missing values), and provides the outputs using the conventions and formats compliant with community data standards. Most processed outputs are written to a standardized, descriptive format known as the Network Common Data Format (NetCDF; Unidata, 2015). As noted earlier, LDT is designed to encompass a broad set of functionalities that complement the modeling, data assimilation and evaluation environments of the LIS framework. Together, the LDT-LIS-LVT series conforms to the MDF concept (Raupach et al., 2005), where LDT supports the input data processing needs of the modeling system of LIS and LVT provides the evaluation procedures to help with revising and improving any of the input and model formulations. Figure 1, modeled after the schematic outlined in Williams et al. (2009), highlights these end-to-end connections and capabilities in support of the MDF paradigm. 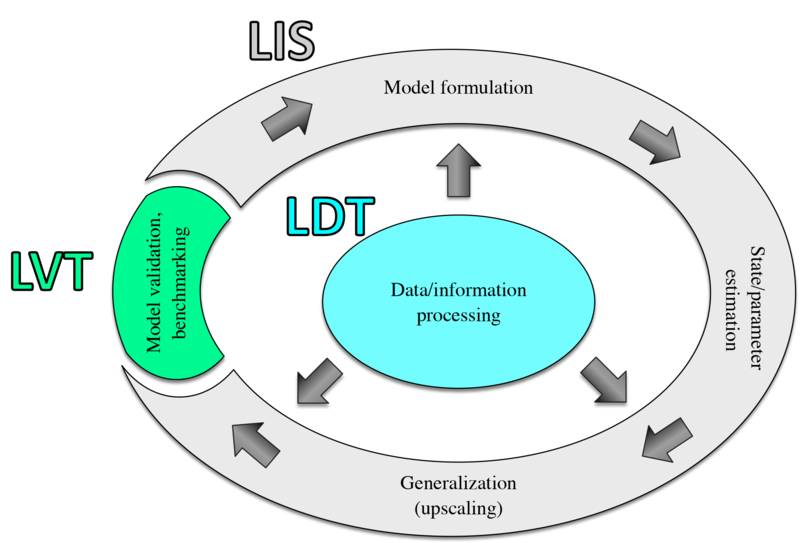 LDT plays a central role in enabling this vision, by providing the data and information processing capabilities, which LIS and LVT use to enable an iterative process of model formulation, state and parameter estimation and refinement, generalization, and model validation and benchmarking. Figure 2Schematic of LDT's main software architecture, showing the various core structures, abstraction layer, and use case implementations. LDT shares an object-oriented framework design with LIS, with a number of points of flexibility known as “plug-ins”. Specific implementations (such as soil parameter datasets or a surface meteorological forcing) are added to the framework through the plug-in interfaces. LDT uses the plug-in-based architecture to support the processing of different types of observational datasets, ranging from in situ, satellite, and remotely sensed products to reanalysis products. The LDT software structure is organized into three layers: (1) the LDT core layer, (2) the “Abstractions” layer, and (3) the “Use case” layer. The latter represents the functional implementations of the Abstractions layer. Figure 2 outlines this structure and what is defined further in each layer. The “core” top layer executes the generic functions of time management, defining the output fields, geospatial transforms, top-level handling of the different model parameters, and meteorological dataset processing. The Abstractions layer enables “pluggable” interfaces with which to incorporate different features, run modes, model datasets, and other functionalities. Also, a key aspect of the Abstractions layer is the ability to reuse the plug-ins to support additional features and expand LDT's capabilities. The LDT code is implemented in Fortran 90 and C programming languages. The C-language-based virtual function table implementation is used to simulate polymorphic behavior for the extensible components in LDT. These function tables enable the Abstractions layer constructs. LDT is also supported by a variety of libraries, which handle not only the data format aspects (e.g., NetCDF I/O) but also the core routines as supplied by the Earth System Modeling Framework (ESMF; Hill et al., 2004) library. ESMF is a library framework to support the building and coupling of earth system model components. ESMF provides several “off-the-shelf” infrastructure utilities such as clock/time manager and generic constructs for storing and exchanging data between various system components. LDT utilizes several ESMF features for passing information between the plug-in components and the core routines. A number of libraries to enable the support for common earth science data formats are also utilized in LDT. They include the latest NetCDF, version 4 (NetCDF-4), Hierarchical Data Format (HDF5; The HDF Group, 2015), HDF-EOS (or HDF-4), and the GRidded Binary or General Regularly distributed Information in Binary form (GRIB) data formats, versions 1 and 2. Currently, the GRIB data formats are supported using the European Centre for Medium-Range Weather Forecasts (ECMWF)'s GRIB Application Programming Interface (GRIB-API) library (ECMWF, 2015) and will be replaced with the latest ECMWF's ecCodes. Finally, LDT handles other data format libraries, including the Tagged Image File Format (TIFF) and the Band Interleaved by Line (BIL) format, both used mostly with remotely sensed data and widely supported in GIS software environments and applications. TIFF formatted files are read-in using the Geospatial Data Abstraction Library (GDAL; http://www.gdal.org/, last access: 31 January 2018) translation library, which is linked and invoked via the FortranGIS project libraries (https://github.com/dcesari/fortrangis, last access: 31 January 2018). Figure 3Schematic depicting the current and different components in LDT. LDT provides a range of features and capabilities that support the land surface and hydrological modeling communities. The current features and options are described further in detail below. 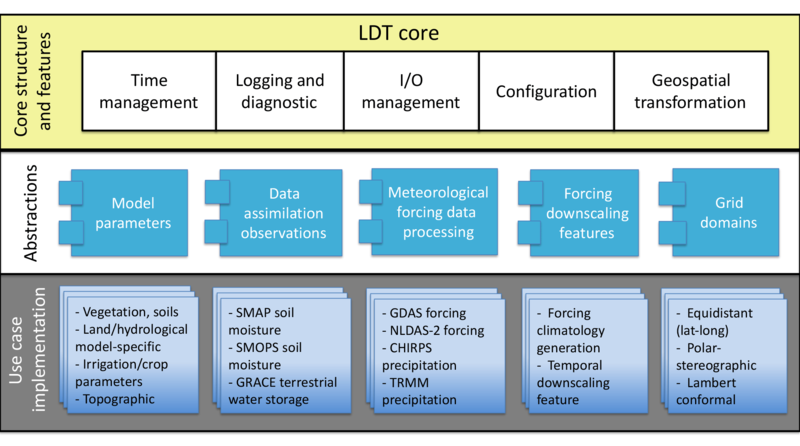 Figure 3 provides an overview of the current LDT capabilities and components. Figure 4Vegetation distribution fraction of four different MODIS IGBP land cover classes (as produced by LDT): evergreen needleleaf (a), deciduous broadleaf forest (b), open shrublands (c), and general cropland (d). Values greater than 0.9 indicate where more than 90 % of given grid cell (0.125∘ grid cell resolution, in this example) is dominated by that vegetation type. For LSMs and hydrological models, the importance of providing representative or “realistic” physical parameters has been shown in several studies (e.g., Sun and Bosilovich, 1996; Duan et al., 2006; Bounoua et al., 2006; Nearing et al., 2016). The key parameter types required for LSMs include (1) land cover/vegetation, (2) land/water mask, (3) soils, and (4) topography. Many land surface models contain tables of physical parameters that are indexed by spatial maps of parameter types (e.g., roughness length indexed by land cover type or saturated hydraulic conductivity indexed by soil texture class). Alternatively, physical parameters themselves may be specified on each model grid (e.g., snow-free albedo, green vegetation fraction). Adjunct models to LSMs include streamflow routing models and lake models. These models may be included with or separate from the LSM. Depending on their dimensionality and complexity, streamflow routing models require information about flow directions, drainage areas, slopes, roughness, and lengths of river reaches. Similarly, lake models require information about lake area and depth(s). The first major parameter type of any land-based model is the vegetation or land cover (or use) classification map. Not capturing the correct land cover at different scales can lead to errors or impacts on other modeled processes, e.g., coupled feedbacks (Bounoua et al., 2006). Another feature in some LSMs is the concept of representing sub-grid heterogeneity, also referred to as sub-grid “tiling”. Instead of considering the dominant land characteristics only, the sub-grid tiling approaches represent a grid cell as a mosaic of a number of homogeneous elements, determined from the distribution of land parameters within a grid cell (e.g., Avissar and Pielke, 1989; Koster and Suarez, 1992). Sub-grid tiling is aimed at better representing land surface model effects and feedback to coupled atmospheric models (e.g., Giorgi and Avissar, 1997; Essery et al., 2003; de Vrese et al., 2016). In addition to vegetation-based tiling, the effects of soil moisture distribution (e.g., Entekhabi and Eagleson, 1989) and elevation-based sub-grid variability (e.g., Leung and Ghan, 1995; Nijssen et al., 2001; Newman et al., 2014) on different water budget variables, like runoff and atmospheric response, have been investigated. LDT has been designed to support the representation of sub-grid tiling not only for vegetation but also for multidimensional combinations of properties, including soil types and topographic derivatives (e.g., elevation, slope). Similar approaches have been developed for hydrological response units to capture sub-grid heterogeneity for land model processes (Chaney et al., 2016). LDT uses the vegetation or land use map as a primary input parameter from which sub-grid heterogeneity can be statistically represented and a corresponding land–water mask can also be derived. 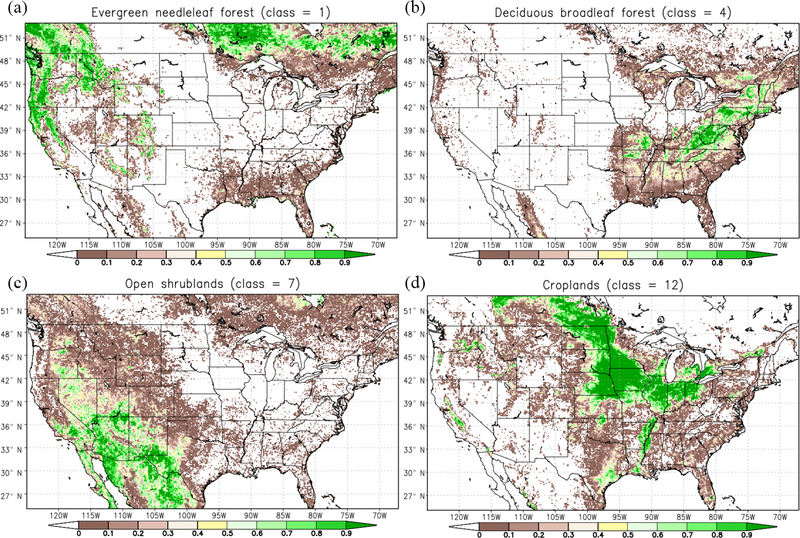 Figure 4 shows example vegetation tile frequency maps from four different vegetation classes (e.g., evergreen needle leaf, croplands) belonging to the Moderate Resolution Imaging Spectroradiometer (MODIS) International Geosphere-Biosphere Programme (IGBP) land cover classification map (Friedl et al., 2002). LDT can read in a moderately high-resolution vegetation map (e.g., <1 km per grid cell) and generate the tiled frequency maps, as highlighted in Fig. 4. In addition to land cover, LDT also represents the sub-grid-scale distribution of soil types and topography datasets within a grid cell. The ability of LDT to represent the distribution of fine-scale features of the underlying data for other land characteristics such as soils and topography allows a more flexible tiling representation, based on any of these features, or a combination of them. Land cover and land use map options in LDT include the U.S. Geological Survey (USGS) 24-class land cover (USGS GLCC), the University of Maryland (UMD) Advanced Very High Resolution Radiometer (AVHRR) land cover map (Hansen et al., 2000), and a few other dataset options, like Mosaic LSM vegetation types (Koster and Suarez, 1996) and JULES (Dunderdale et al., 1999). Closely related to the vegetation type and land use parameters described above is the “mask” field, which identifies valid grid cells on which the model will run. Typically for a land surface or hydrological model, the mask discriminates between land and open water points, assigning an index value, like 1, to the valid land points. In LDT, such a mask can be derived from the land classification map or read in and imposed. If imposed, LDT ensures that all processed parameters are geographically co-registered and consistent with the input mask. A variety of options exist in LDT to ensure consistency between the masks and model parameters. These options include allowing the user to select neighboring grid cells to fill in a parameter value when the land mask indicates a valid land point but the parameter has a missing value. If no valid neighboring values are available (e.g., in the case of small islands), the user can then specify a universal value to fill in the missing data. In addition, LDT offers other parameter processing features, such as upscaling (e.g., averaging) or downscaling techniques (e.g., bilinear interpolation) and different projections (e.g., equidistant geographic coordinate system, polar stereographic). 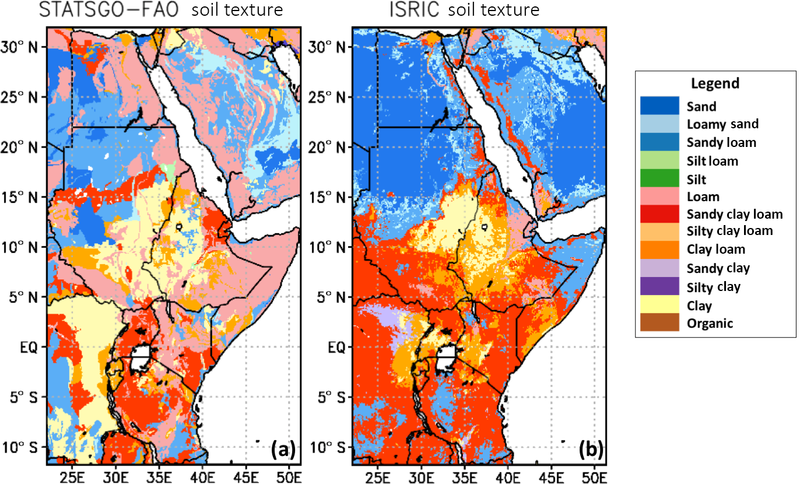 Figure 5Comparison of the (a) STATSGO-FAO soil texture class map (originally at 1 km resolution) versus the (b) ISRIC soil texture map (originally at 250 m resolution). Dominant texture classes are shown here at 10 km spatial resolution. Another key LSM parameter involves the representation of soil types. LDT offers a variety of data options, including soil texture and soil-fraction-based maps (i.e., sand and clay fractions), depending on what the LSM needs. As mentioned above, sub-grid tiling can be generated and represented by LDT using both the soil texture and soil-fraction maps. Some of the current soil data options include the original Food and Agricultural Organization soil texture and fraction maps (Reynolds et al., 2000); the blended STATSGO (Miller and White, 1998), version 1; the Food and Agriculture Organization (FAO) global soil texture map (Reynolds et al., 2000); and the International Soil Reference and Information Centre (ISRIC) texture, fractional, and other soil property-based dataset (Hengl et al., 2014). 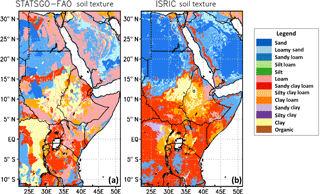 Figure 5 shows an example comparison of soil texture classes over the eastern Africa region from the STATSGO-FAO and ISRIC soil texture maps, as processed through LDT. Table 1LSMs and some of their parameters supported in LDT. Note that several LSMs use the land cover type and/or the soil texture type for each tile within LIS in combination with a lookup table to generate vegetation or soil parameters for that tile. Currently, processing of the parameters for several land surface and hydrologic models is supported by LDT (and LIS), as summarized in Table 1. These models are the state-of-the art in representing the key processes of the terrestrial energy, water and carbon cycles as well as specialized process representations of specific features of the land surface (e.g., lakes, urban). Some of the LSMs include Noah versions 2.7.1 and later (Chen et al., 1996), Catchment LSM (Koster et al., 2000), JULES (Best et al., 2011), and several others. LDT also processes final inputs for the Hydrological Modeling and Analysis Platform (HyMAP) (Getirana et al., 2012, 2017), which is a hydrological routing scheme in LIS and collects and routes LSM-based total runoff through a network of catchments and tributaries to major river stems. Finally, LDT supports the processing of lake model parameters, e.g., water depth for freshwater lake models such as FLake (Kirillin et al., 2011). The complexity of these model formulations continues to increase with the addition of new components (e.g., crop, groundwater models), fine-scale modeling needs (e.g., topographical downscaling), and efforts to include impacts of human management (e.g., irrigation). LDT provides a number of schemes and datasets to address the data processing requirements of these additional components. For example, the processing of irrigation intensity information from the MODIS-based irrigation map developed by Ozdogan and Gutman (2008) and the Global Rain-Fed, Irrigated and Paddy Croplands (GRIPC; Salmon et al., 2015) are supported within LDT. Also, crop information is available, which includes the CROPMAP scheme in Ozdogan et al. (2010), and the updated, high-variety crop map of Monfreda et al. (2008). To enable the topographical downscaling of meteorological fields for fine-scale modeling, LDT processes elevation, slope, and aspect datasets. High-resolution precipitation climatology maps from the Parameter-elevation Relationships on Independent Slopes Model (PRISM; Daly et al., 1997) or from WorldClim (Fick and Hijmans, 2017) can be ingested within LDT for downscaling and bias-correcting precipitation fields. LDT also supports different topographic map options (e.g., elevation, slope), which include the GTOPO30 (Gesch et al., 1999) and the Shuttle Radar Topography Mission, 30 arcsec (SRTM30; Jarvis et al., 2008) digital elevation model (DEM) datasets (globally, 30 arcsec resolution versions). Similar to model parameters, model initial conditions (ICs) are required by all LSMs to simulate land surface model states and fluxes (e.g., Cosgrove et al., 2004; Rodell et al., 2005). Climatologically averaged, state-based initial conditions have been shown to provide more optimal initial conditions for LSM and hydrological model simulations than other methods (Rodell et al., 2005). One example of improving the model initial conditions was shown in Xia et al. (2012), going from a 1-year spin-up period, originally used in the North American LDAS, phase 1 (NLDAS-1), to two stages of running several years and averaging selected dates (e.g., 1 January) for NLDAS, phase 2 (NLDAS-2). Running for several years improved the initial conditions for the NLDAS-2 model simulations, whereas the 1-year NLDAS-1 spin-up produced “lingering effects” on the soil moisture fields. LDT offers a feature to generate such climatological initial conditions. The climatological initial conditions are generated by taking an average of the same date and time (e.g., 1 June, at 00:00 Z) over multiple years (e.g., 1982–2010). LDT also provides the capability to produce an IC-based file to initialize an ensemble simulation, e.g., for a seasonal forecast ensemble, going from a single-member model “restart” file to a multi-member file, which we refer to as ensemble “disaggregation”. In addition, an option exists to calculate the ensemble average from a multi-member IC (or restart) file to form a single-member IC file, which we refer to as ensemble “aggregation”. These options can support initializing data assimilation and forecast ensemble model simulations. The use of observational data from satellites and other remote-sensing platforms is a growing area of research in the land/hydrological modeling community. The information from these observational data sources is often used to improve the characterization of model states through data assimilation (DA; e.g., Reichle et al., 2002; Kumar et al., 2008c) and model parameters through inverse modeling techniques (e.g., Harrison et al., 2012). The computational systems of DA and inverse modeling, built around the physical models, have their own data and processing requirements. Most DA systems are designed to address and improve the random errors in models and expect the input datasets to be generally unbiased relative to model estimates. A common approach in the land DA community to enable these “bias-blind” (Dee, 2005) systems is to rescale the observational data to be consistent with the model climatology, which is simply a multiyear average of model states. The development of model and observational data climatologies to enable such reprocessing is supported within LDT. For soil moisture data assimilation, a commonly used rescaling approach is called CDF matching where cumulative distribution functions (CDFs) are used to bias-correct and reduce differences in observation and model states (Reichle and Koster, 2004). This scaling approach matches the CDF of the observation to that of the model and corrects all moments (e.g., first and second) of the observation distribution, regardless of its shape. To generate CDFs with LDT, the user must supply multiple years of model output and observational data for the a given variable. LDT then produces model- and observation-based CDF data, separately, at each model grid point, which the DA system can use to perform the rescaling. The user can select the granularity, temporal averaging period, and data count threshold to generate the CDF files. The CDFs can also be generated either based on lumped annually based values (“lumped”) or seasonally stratified CDF values (i.e., “monthly”). Kumar et al. (2015) demonstrated that the use of seasonal CDFs reduces the statistical errors from CDF matching in soil moisture DA, compared to the use of lumped CDFs. Finally, LDT can account for spatial sampling by using neighboring pixels to increase the sampling density in the CDF calculations (e.g., when a data record period is short; based on Reichle and Koster, 2004) or by grouping CDFs by land cover or soil texture type. Table 2Different DA remotely sensed observational or land surface model data types supported in LDT and LIS. LDT supports several different satellite-based observational data types that can be used for data assimilation in LIS. These satellite-based observations include a variety of soil moisture (SM) retrievals, terrestrial water storage (TWS), and snow depth (SNWD). 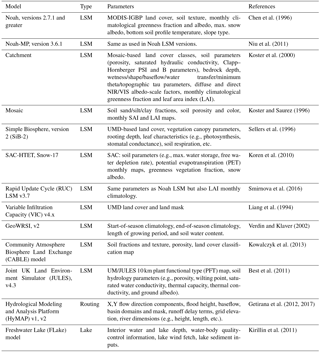 Table 2 summarizes the various products available in LDT, which encapsulate most modern land remote-sensing measurements. The NASA's Gravity Recovery and Climate Experiment (GRACE) TWS anomaly dataset is part of the suite of satellite products that can be processed by LDT and assimilated into LIS. Currently, LDT supports monthly gridded GRACE mass products either in 0.5 or 1.0∘ resolution, regardless of their processing methods (i.e., spherical harmonic or mass concentration). Release-05, or RL05, products have been provided by the University of Texas Center for Space Research (CSR), NASA's Jet Propulsion Laboratory (JPL), and the German Research Centre for Geosciences (GFZ). Along with the GRACE anomaly product, LDT can incorporate GRACE scaling information and leakage errors that are provided with the spherical harmonic products (Kumar et al., 2016). In addition, CSR provides a higher-resolution RL05 version at 0.5 degree but using the Mascon solution (Save et al., 2016). LDT reads in the raw GRACE anomaly data and incorporates that information into model-based TWS information (units of mm), for example, as in Kumar et al. (2016). The final data produced are referred to as total TWS. Figure 6 shows an example of the LDT-produced total TWS, after incorporating the GRACE TWS anomaly information. LDT also allows the definition of an “exchange grid” for DA, a domain that is used for the calculation of the observation minus the model forecast estimates (called “innovations”). The use of the exchange grid allows improved consistency between observations and the simulated model forecasts. The exchange grid information generated by LDT is then employed by the DA system in the calculation of data assimilation updates. LSMs driven with higher spatial resolution and observational data have been shown to have improved land states and fluxes over coarser and model-only generated meteorological inputs (e.g., Masson et al., 2003; Reichle et al., 2011). Higher-resolution forcing datasets can improve land model ICs, for example, in coupled atmospheric simulations (e.g., Kumar et al., 2008a; Case et al., 2008). LIS and LDT support a large variety of meteorological reanalysis, observational forcings, and seasonal climate forecast datasets. LDT supports a large suite of meteorological forcing data, and it can be used as a stand-alone tool to downscale spatially and temporally, to merge, and to quality control these different forcing datasets. The final meteorological fields are written to a single file in NetCDF-4 format. At this time, LDT supports two basic ways of processing meteorological datasets. First, LDT can be used to spatially and temporally interpolate to downscale and merge (or “overlay”) different meteorological forcing datasets using the “Metforcing processing” run mode option. A second option exists where the user can generate climatological forcing datasets to capture diurnal and seasonal cycles of longer-term forcing data records. This second feature works with a variety of meteorological datasets, including overlaying multiple datasets, to generate a more comprehensive climatological forcing (available down to an hourly climatology). This climatology option can be used for different applications, including generating forcing used in forcing ensembles and climatology forecast capabilities. Figure 6Examples of LDT-processed GRACE-based total TWS (in mm). (a) Plot of the LDT-processed TWS data for the southern African region for February, 2011 and (b) a time-series plot of the TWS data for years 2003–2015 and latitude of −21∘ S and longitude of 24∘ E.
Generating higher-resolution meteorological inputs can be very important in driving the LSM or hydrological models, especially over mountainous regions, to better capture fine-scale features, such as variations in temperature or incoming solar radiation on snowpack dynamics (e.g., Rasmussen et al., 2011). Several studies have further downscaled reanalysis and forecast datasets, which include seasonal climate and climate change (e.g., Maraun et al., 2010), showing improved meteorological and hydrological representation at those scales. Also, temporal disaggregation of coarser timescale forcing data (e.g., daily) has been shown to improve hydrological representation versus simply applying a uniform rate (e.g., over the day; Ryo et al., 2014). Such methods are also applied in the GLDAS (Rodell et al., 2004) and NLDAS (Cosgrove et al., 2003) forcing downscaling approaches. LDT offers some options for either spatially or temporally disaggregating forcing datasets. For temporal disaggregation, forcing datasets that are at coarser timesteps, e.g., daily or greater, can be interpolated to a finer timestep (e.g., 3-hourly). For example, daily observed precipitation fields can be disaggregated using precipitation fields at finer timesteps, e.g., hourly fields from the MERRA, version 2 (MERRA-2), by applying weights from the MERRA-2 precipitation to create sub-daily precipitation from the daily product. This approach is based on Cosgrove et al. (2003), and it is preferred for LSMs over other methods, e.g., simply distributing a daily precipitation product at the same rate (uniform) over each sub-daily (e.g., 3-hourly) timestep (e.g., Sen Gupta and Tarboton, 2016). Current spatial downscaling techniques available from LDT, in conjunction with LIS, include using higher-resolution (e.g., 1 km), monthly precipitation climatology datasets, such as from the PRISM (Daly et al., 1997) or WorldClim (Fick and Hijmans, 2017) to spatially downscale coarser-scale precipitation data. Specifically, LDT calculates and stores the ratio of high-resolution precipitation climatology versus the same climatology aggregated at the coarser-scale resolution. These ratios reflect how spatial patterns of monthly precipitation change with respect to spatial resolutions and therefore provide a basis for spatially downscaling precipitation data when read into LIS. If the climatology of the precipitation data used to run LIS is also available, spatial downscaling can be performed in conjunction with bias correction. In this case, for example, LDT calculates the ratio of 1 km PRISM climatology to that of the coarser-scale precipitation used by LIS and stores the ratio (at the simulation resolution) in the LIS parameter file. LIS in turn reads the ratio and applies it to precipitation data each time when new forcing data are read. By definition, the output precipitation field from LIS will have the same climatology as PRISM in each calendar month, hence removing the bias of the coarser-scale precipitation climatology relative to that of the finer-scale precipitation climatology. Figure 7Examples of LDT-processed SRTM elevation parameter (in meters) at both (a) 12.5 km and (c) 1 km resolutions. (b) NLDAS-2 air temperature forcing field at its native 12.5 km resolution on 1 April 2005 (18:00 Z). (d) The 1 km resolution SRTM elevation field was then used to “topographically downscale” the NLDAS-2 air temperature (in units of K) using the lapse-rate correction approach for the finer-detailed 1 km air temperature field, as shown in plot (d). Other spatial disaggregation techniques available in LDT include the ability to process topographic maps (e.g., elevation, slope) and forcing-based lowest-layer terrain heights, which can be used in LIS to further downscale the forcing fields in two different ways. The first approach follows that used in NLDAS-1 and 2 (e.g., Cosgrove et al., 2003), where a static environmental lapse rate (of 6.5 K km−1) is used to apply an elevation adjustment to the spatially coarser meteorological fields (e.g., air temperature, specific humidity) to finer scales (e.g., 1 km) to capture greater terrain spatial variability. This lapse-rate correction can, for instance, improve air temperature representation in mountainous regions. Figure 7 highlights the comparison of NLDAS-2 forcing dataset at its native 12.5 km (or 0.125 degree) resolution and then downscaled using the lapse-rate adjustment method with SRTM elevation to 1 km resolution using the SRTM 1 km elevation parameter file. The ability to generate spatially varying atmospheric lapse rates based on atmospheric pressure levels and temperatures (e.g., Sen Gupta and Tarboton, 2016) is not available within LDT, but it could be expanded to include this approach. Finally, LDT processes and provides high-resolution slope and aspect fields, which are applied in LIS to adjust downward solar radiation fields. Accounting for slope and aspect has been shown to improve radiation budgets and snow simulations in mountainous regions (e.g., Kumar et al., 2013). Despite the huge advancements in modeling made possible by “physical” models, they have fundamental limitations in their ability to accurately portray the complex processes of the Earth system. For example, the significant human footprint on the hydrological cycle has essentially led to a “replumbing” of the global hydrological cycle through activities such as agriculture and infrastructure development, leading to the recognition of a new geological epoch called the Anthropocene (Zalasiewicz et al., 2011). The accurate representation of the replumbing is critical for understanding the consequences of human activity on water resources and its contribution to hydrological extremes. Due to the often subjective nature of the human-engineered processes, the conceptual physical models are limited in their ability to represent Anthropocene processes. On the other hand, large-scale observations from satellites and remote-sensing platforms provide a huge opportunity to represent them, which is only possible if sophisticated data processing and data-driven models are available to fully exploit the information content of such measurements. The availability of increased amounts of earth science data and the power of modern computers present an ideal scenario for employing machine learning (ML) techniques for data-driven modeling and predictive analytics. ML-methods essentially develop nonlinear feature transformations learned from mapping a set of inputs to a set of outputs. More recent advancements in ML such as deep learning (Bengio, 2009), modeled after the human cognitive process, allow the modeling of more complex relationships among the data and incremental learning. Generally, the data-driven ML models are a good alternative to the physical models when it is difficult to build knowledge-driven simulation models in cases where the understanding of the underlying processes is lacking. With this recognition, LDT includes an ML layer designed to support a variety of ML algorithms and training models. The ML models developed from LDT are expected to augment the physical models and data assimilation environments. Currently the ML layer in LDT includes shallow learning algorithms such as the Artificial Neural Network (ANN), which consists of an input layer, an output layer, and a set of hidden layers. The user specifies the input and output layers, whereas the topology of the hidden layer is constructed within LDT. During the training phase, LDT is presented with a set of inputs and the corresponding outputs, which are used to develop a set of weights and interconnections within the ANN. The trained network can then be used for generating predictions with a new set of inputs. The ML-based trained network models can be a useful operator within DA environments. Most satellite instruments detect radiances (electromagnetic energy over specific wavelengths), and the conversion of these raw measurements to geophysical variable is not always trivial. The ML techniques can be used to develop models that translate between radiance measurements and related geophysical quantities. Such models can then be used in DA configurations, essentially allowing the direct use of raw satellite measurements in modeling. Figure 8Example of the ML layer utilization in LDT. The top panel shows the schematic of the ANN which ingests a suite of LSM-based and remote-sensing-based inputs for developing predictions of snow depth. The bottom panel shows the performance of the trained network against in situ observations from the GHCN network. An example of such a scenario is presented in Fig. 8. The input ML layer in LDT is used to ingest radiance measurements for the 18 and 36 GHz channels (both horizontal and vertical polarizations) from the AMSR2 instrument on the Global Change Observation Mission-Water (GCOM-W) satellite (Wentz et al., 2014). In addition, the input layer is presented with the fractional snow cover data from MODIS Terra instrument (MOD10A1) and the outputs from a LIS model simulation (variables including precipitation, green vegetation fraction, soil moisture, and soil temperature). The ANN within LDT is then trained against the daily snow depth measurements from the Global Historical Climate Network (GHCN) for a period of approximately 1 year (1 August 2012 to 31 July 2013). The training is conducted at a point location (Tierra Amarilla in New Mexico, 36.7∘ E, 106.6∘ W), where the snow evolution is often ephemeral, making an accurate prediction difficult. The bottom panel of Fig. 8 shows the performance of the trained network, when used for prediction in the following year (1 August 2013 to 31 July 2014). The snow evolution is captured well by the ANN-based predictions. The specification of the input and output layers is user-defined and customizable. The ML layer in LDT can also be used for developing data-driven models both in a spatially distributed manner (where the training is done on a grid cell by grid cell basis) and on an aggregate basis (where a single trained model is developed using available inputs for all grid cells). Land data assimilation systems (LDASs) require the integration of high-quality observations with state-of-the-art land surface and hydrological models to acquire robust estimates of land surface conditions to meet the needs of applications involving weather and climate modeling, water resources management and modeling of hydrological extremes, among others. The synthesis of several types of model and observation data across various spatial and temporal resolutions and extents is needed to support the development of flexible LDAS configurations for conducting both research and application-oriented studies. To offer such a data fusion software framework, the Land surface Data Toolkit (LDT) has been developed with a large suite of capabilities including (1) parameter processing for a wide variety of models including land surface, hydrological, lake and streamflow models; (2) the creation of initial conditions (e.g., climatological restarts) from model runs; (3) data assimilation preprocessing support; (4) meteorological forcing data processing for inputs to the models; and (5) data-driven models based on machine learning to assist the physical modeling and DA environments. LDT provides a formal environment to handle the data-related needs within the model–data fusion concept, which is recognized to be essential for the systematic development and improvement of Earth system models. LDT serves as the main preprocessor to the NASA Land Information System (LIS), which is an integrated framework designed for multi-model land surface model (LSM) and data assimilation (DA) integrations. LDT can also be used independently as an observational and model input processor for other land surface modeling systems. In addition, LDT offers a variety of user options to process model inputs, supports a variety of software libraries, has the ability to read in native (or original) dataset formats, and uses common data formats, like NetCDF-4. LDT is an evolving framework and will continue to be developed with the addition of support for new datasets and data processing algorithms. Over the past several decades, the complexity of land surface models has gradually increased, as they have evolved from the first-generation simple bucket schemes (Manabe, 1969) to models that represent the complex interactions of the terrestrial water, energy, and biogeochemical cycles. In addition, more detailed and fine-scale representations of the land surface (surface and subsurface) also continue to grow, imposing an increased set of data requirements for their effective application at the scales of interest. A formal, extensive, and adaptive environment such as LDT is necessary to support these requirements. Similarly, the land DA applications and their complexity continue to grow with the increasing availability of remote-sensing observations. Sophisticated data fusion models and processing algorithms are required to support the utilization of raw satellite measurements. With the increase in computing power and data science advancements, the machine learning and predictive analytics have become more commonplace in areas involving e-commerce, social media, and health care. The data-rich Earth science arena is an ideal environment for deploying such data science enhancements and the machine learning (ML) layers in LDT will be continually updated to exploit such capabilities. 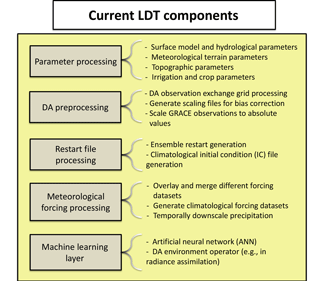 Future LDT capabilities will continue to include new parameter datasets (e.g., land cover, soil types), remotely sensed and in situ observations for DA preprocessing needs, projection grid types (e.g., Mercator projection), additional meteorological forcing datasets and downscaling techniques, and additional machine-learning methods. Parallel decomposition ability is also being developed and supported in LDT. Currently parallel capability is being tested with the meteorological forcing processing and downscaling and with some of the parameter processing features. New LSMs are currently being implemented, including the Community Land Model (CLM; Oleson et al., 2010) and the latest versions of Noah and JULES LSMs. In addition, native parameter processing support is being considered for the Catchment and VIC LSMs, for HyMAP, and for other groundwater-based parameters. Finally, end-to-end data input processing for optimization and parameter estimation along with uncertainty estimation techniques have been considered in future LDT versions, another component fulfilling the model–data fusion (MDF) paradigm with LIS and Land surface Verification Toolkit (LVT). The current version of LDT is release 7.2r version (6 May 2017 release), which is open-source and publicly available from the main LIS website at https://lis.gsfc.nasa.gov/releases (last access: 22 August 2018; Kumar et al., 2006). The persistent identifier for this version is http://doi.org/10.5281/zenodo.1322613. The main LDT features described in this paper can be found with this release. Also, end-use test case examples are provided (https://lis.gsfc.nasa.gov/tests/ldt, last access: 14 March 2018; Arsenault et al., 2018), and additional documentation, including the full user guide and tutorial type presentations, is located here: https://lis.gsfc.nasa.gov/documentation/ldt (last access: 14 March 2018; Arsenault et al., 2018). Future versions of the code will be made also available on GitHub (https://github.com/, last access: 25 July 2018; GitHub, 2018). KRA and SVK designed and developed the main LDT software and led the writing of the paper and figure preparation. SVK is the lead architect of LDT and the Land Information System (LIS) software. JVG, SW, EK, DMM, HKB, AG, MN, BL, and JJ have developed and tested many components of the LDT software. JW and CDP-L have helped oversee and provided feedback on the development of LDT. KRA prepared the paper with contributions from all coauthors. We gratefully acknowledge the financial support from NASA Earth Science Technology Office (ESTO), the Air Force Life Cycle Management Center, NASA Applied Sciences Water Resources Program, NOAA's Climate Program Office (MAPP program), NASA's High Mountain Asia, SERVIR Applied Sciences Team and Terrestrial Hydrology, NASA's Internal Research And Development (IRAD) program, and NASA's National Climate Assessment (NCA) program, which all contributed to the development of LDT. Computing was supported by the resources at the NASA Center for Climate Simulation (NCCS). We also want to thank our user community for their invaluable feedback in supporting LDT's development and feature implementation. Arsenault, K. R., Kumar, S., Geiger, J., Wang, S., Kemp, E., Beaudoing, H., and Li, B: The Land surface Data Toolkit (LDT) (Version version 7.2), Zenodo, https://doi.org/10.5281/zenodo.1322613, 2017. Avissar, R. and Pielke, R.: A parameterization of heterogeneous land surfaces for atmospheric numerical models and its impact on regional meteorology, Mon. Weather Rev., 117, 2113–2136, 1989. Bartalis, Z., Naeimi, V., Hasenauer, S., and Wagner, W.: ASCAT Soil Moisture Product Handbook, Report No. ASCAT Soil Moisture Report Series, No. 15, 30 pp., 2008. Bengio, Y.: Learning Deep Architectures for AI, Found. Trends in Mach. Learn., 2, 1–127, https://doi.org/10.1561/2200000006, 2009. Bounoua, L., Masek, J., and Tourre, Y. M.: Sensitivity of surface climate to land surface parameters: A case study using the simple biosphere model SiB2, J. Geophys. Res., 111, D22S09, https://doi.org/10.1029/2006JD007309, 2006. Case, J., Crosson, W., Kumar, S., Lapenta, W., and Peters-Lidard, C.: Impacts of High-Resolution Land Surface Initialization on Regional Sensible Weather Forecasts from the WRF Model, J. Hydrometeorol., 9, 1249–1266, https://doi.org/10.1175/2008JHM990.1, 2008. Chaney, N.W., Metcalfe, P., and Wood, E. F.: HydroBlocks: a field-scale resolving land surface model for application over continental extents, Hydrol. Process., 30, 3543–3559, https://doi.org/10.1002/hyp.10891, 2016. Chen, F., Manning, K. W., LeMone, M. A., Trier, S. B., Alfieri, J.G., Roberts, R., Tewari, M., Niyogi, D., Horst, T. W., Oncley, S. P., Basara, J. B., and Blanken, P. D.: Description and Evaluation of the Characteristics of the NCAR High-Resolution Land Data Assimilation System, J. Appl. Meteor. Climatol., 46, 694–713, https://doi.org/10.1175/JAM2463.1, 2007. Chen, F., Mitchell, K., Schaake, J., Xue, Y., Pan, H., Koren, V., Duan, Y., Ek, M., and Betts, A.: Modeling of land-surface evaporation by four schemes and comparison with FIFE observations, J. Geophys. Res., 101, 7251–7268, 1996. Cosgrove, B. A., Lohmann, D., Mitchell, K. E., Houser, P. R., Wood, E. F., Schaake, J. C., Robock, A., Marshall, C., Sheffield, J., Duan, Q., Luo, L., Higgins, R. W., Pinker, R. T., Tarpley, J. D., and Meng, J.: Real-time and retrospective forcing in the North American Land Data Assimilation System (NLDAS) project, J. Geophys. Res., 108, 8842, https://doi.org/10.1029/2002JD003118, 2003. Cosgrove, B. A., Lohmann, D., Mitchell, K. E., Houser, P. R., Wood, E. F., Schaake, J. C., Robock, A., Sheffield, J., Duan, Q., Luo, L., Higgins, R. W., Pinker, R. T., Tarpley, J. D.: Land surface model spin-up behavior in the North American Land Data Assimilation System (NLDAS), J. Geophys. Res., 108, 8845, https://doi.org/10.1029/2002JD003316, 2004. Daly, C., Taylor, G., and Gibson, W.: The PRISM approach to mapping precipitation and temperature, 10th AMS Conf. on Applied Climatology, Reno, NV, 10–12, 1997. Dee, D.: Bias and data assimilation, Q. J. Roy. Meteorol. Soc., 131, 3323–3343, 2005.
de Vrese, P., Schulz, J.-P., and Hagemann, S.: On the representation of heterogeneity in land-surface-atmosphere coupling, Bound.-Layer Meteorol., 160, 157–183, https://doi.org/10.1007/s10546-016-0133-1, 2016. Duan, Q., Schaake, J., Andreassian, V., Franks, S., Goteti, G., Gupta, H.V., Gusev, Y. M., Habets, F., Hall, A., Hay, L., Hogue, T., Huang, M., Leavesley, G., Liang, X., Nasonova, O.N., Noilhan, J., Oudin, L., Sorooshian, S., Wagener, T., and Wood, E. F.: Model Parameter Estimation Experiment (MOPEX): An overview of science strategy and major results from the second and third workshops, J. Hydrol., 320, 3–17, https://doi.org/10.1016/j.jhydrol.2005.07.031, 2006. Dunderdale, M., Muller, J. P., and Cox, P. M.: “Sensitivity of the Hadley Centre climate model to different earth observation and cartographically derived land surface data-sets”, in: The Contribution of POLDER and New Generation Spaceborne Sensors to Global Change Studies, 1–6, Meribel, France, 1999. Entekhabi, D. and Eagleson, P.: Land surface hydrology parameterization for atmospheric General Circulation models including subgrid scale spatial variability, J. Climate, 2, 816–831, https://doi.org/10.1175/1520-0442(1989)002<0816:LSHPFA>2.0.CO;2, 1989. Entekhabi, D., Yueh, S., O'Neill, P., et al. : SMAP Handbook, JPL Publication JPL 400-1567, Jet Propulsion Laboratory, Pasadena, California, 182 pp., 2014. Esri, ArcGIS Desktop: Release 10.5, Redlands, CA: Environmental Systems Research Institute, 2016. Essery, R. L. H., Best, M. J., Betts, R. A., and Cox, P. M.: Explicit representation of subgrid heterogeneity in a GCM land surface scheme, J. Hydrometeorol., 4, 530–543, 2003. European Centre for Medium-Range Weather Forecasts (ECMWF): GRIB API version 1.10.0 and onwards, available at: https://software.ecmwf.int/wiki/display/GRIB/Home (last access: 25 July 2018), 2015. Fick, S. E. and Hijmans, S. E.: WorldClim 2: new 1-km spatial resolution climate surfaces for global land areas, Int. J. Climatol., 37, 4302–4315, https://doi.org/10.1002/joc.5086, 2017. Fiddes, J. and Gruber, S.: TopoSCALE v.1.0: downscaling gridded climate data in complex terrain, Geosci. Model Dev., 7, 387–405, https://doi.org/10.5194/gmd-7-387-2014, 2014. Friedl, M. A., McIver, D. K., Hodges, J. C. F., Zhang, X. Y., Muchoney, D., Strahler, A. H., Woodcock, C. E., Gopal, S., Schneider, A., Cooper, A., Baccini, A., Gao, F., and Schaaf, C.: Global land cover mapping from MODIS: algorithms and early results, Remote Sens. Environ., 83, 287–302, https://doi.org/10.1016/S0034-4257(02)00078-0, 2002. Getirana, A. C., Boone, A., Yamazaki, D., Decharme, B., Papa, F., and Mognard, N.: The Hydrological Modelling and Analysis Platform (HyMAP): Evaluation in the Amazon Basin, J. Hydrometeorol., 13, 1641–1665, https://doi.org/10.1175/jhm-d-12-021.1, 2012. Getirana, A., Peters-Lidard, C., Rodell, M., and Bates, P. D.: Trade-off between cost and accuracy in large-scale surface water dynamic modelling, Water Resour. Res., 53, 4942–4955, https://doi.org/10.1002/2017WR020519, 2017. Gesch, D. B., Verdin, K. L., and Greenlee, S. K.: New land surface digital elevation model covers the Earth, Eos Trans. AGU, 80, 69–70, https://doi.org/10.1029/99EO00050, 1999. Giorgi, F. and Avissar, R.: Representation of heterogeneity effects in Earth system modelling: Experience from land surface modelling, Rev. Geophys., 35, 413–437, https://doi.org/10.1029/97RG01754, 1997. GitHub: available at: https://github.com, last access: 25 July 2018. Gochis, D. J., Yu, W., and Yates, D. N.: The WRF-Hydro model technical description and user's guide, version 2.0. NCAR Technical Document, 120 pages, 2014, available at: WRF-Hydro 2.0 User Guide; WRF-Hydro Preprocesser Guide and Information: https://www.ral.ucar.edu/projects/wrf_hydro (last access: 25 July 2018), 2014. Hansen, M., DeFries, R., Townshend, J. R. G., and Sohlberg, R.: Global land cover classification at 1km resolution using a decision tree classifier, Int. J. Remote Sens., 21, 1331–1365. https://doi.org/10.1080/014311600210209, 2000. Harrison, K. W., Kumar, S. V, Peters-Lidard, C. D., and Santanello, J. A.: Quantifying the change in soil moisture modelling uncertainty from remote sensing observations using Bayesian inference techniques, Water Resour. Res., 48, W11514, https://doi.org/10.1029/2012WR012337, 2012. Hengl, T., de Jesus, J. M., MacMillan, R. A., Batjes, N. H., Heuvelink, G. B. M., Ribeiro, E., Samuel-Rosa, A., Kempen, B., Leenaars, J. G. B., Walsh, M. G., and Gonzalez, M. R.: SoilGrids1km – Global Soil Information Based on Automated Mapping, PLoS ONE, 9, e105992, https://doi.org/10.1371/journal.pone.0105992, 2014. Hill, C., DeLuca, C., Balaji, V., Suarez, M., and da Silva, A.: The Architecture of the Earth System Modelling Framework, Comput. Sci. Eng., 6, 18–28, 2004. Jarvis, A., Reuter, H. I., Nelson, A., and Guevara, E.: Hole-filled SRTM for the globe Version 4, available from the CGIAR-CSI SRTM 90 m Database, available at: http://srtm.csi.cgiar.org (last access: 30 January 2018), 2008. 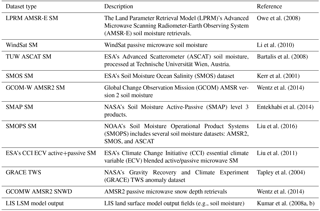 Kerr, Y. H., Waldteufel, P., Wigneron, J.-P., Martinuzzi, J.-M., Font, J., and Berger, M.: Soil Moisture Retrieval from Space: The Soil Moisture and Ocean Salinity (SMOS) Mission, IEEE T. Geosci. Remote Sens., 39, 1729–1735, 2001. Kirillin, G., Hochschild, J., Mironov, D., Terzhevik, A., Golosov, S., and Nützmann, G.: Software, Data and Modelling News: FLake-Global: Online lake model with worldwide coverage, Environ. Modell. Softw., 26, 683–684, https://doi.org/10.1016/j.envsoft.2010.12.004, 2011. Koren, V., Smith, V., Cui, Z., Cosgrove, B., Werner, K., and Zamora, R.: Modification of Sacramento Moisture Accounting Heat Transfer Component (SAC-HT) for Enhanced Evapotranspiration, NOAA Technical Report, NWS 53, U.S. Department of Commerce, NOAA National Weather Service, 2010. Koster, R. D. and Suarez, M. J.: Modelling the land surface boundary in climate models as a composite of independent vegetation stands, J. Geophys. Res., 97, 2697–2715, 1992. Koster, R. and Suarez, M.: Energy and Water Balance Calculations in the Mosaic LSM, NASA Tech. Memo. 104606, Vol. 9, 1996. Koster, R. D., Suarez, M. J., Ducharne, A., Stieglitz, M., and Kumar, P.: A catchment-based approach to modelling land surface processes in a general circulation model: 1. Model structure, J. Geophys. Res., 105, 24809–24822, doi.10.1029/2000JD900327, 2000. Koster, R., Sud, Y., Guo, Z., Dirmeyer, P., Bonan, G., Oleson, K., Chan, E., Verseghy, D., Cox, P., Davies, H., Kowalczyk, E., Gordon, C., Kanae, S., Lawrence, D., Liu, P., Mocko, D., Lu, C., Mitchell, K., Malyshev, S., McAvaney, B., Oki, T., Yamada, T., Pitman, A., Taylor, C., Vasic, R., and Xue, Y.: GLACE: The Global Land-Atmosphere Coupling Experiment. Part I: Overview, J. Hydrometeor., 7, 590–610, https://doi.org/10.1175/JHM510.1, 2006. Kowalczyk, E., Stevens, L., Law, R., Dix, M., Wang, Y., Harman, I., Haynes, K., Srbinovsky, J., Pak, B., and Ziehn, T.: The land surface model component of ACCESS: Description and impact on the simulated surface climatology, Aust. Meteorol. Oceanogr. J., 663, 65–82, 2013. Kumar, S., Peters-Lidard, C., Tian, T., Houser, P., Geiger, J., Olden, S., Lighty, L., Eastman, J., Doty, B., Dirmeyer, P., Adams, J., Mitchell, K., Wood, E., and Sheffield, J.: Land information system: An interoperable framework for high resolution land surface modelling, Environ. Model. Softw., 21, 1402–1415, 2006. 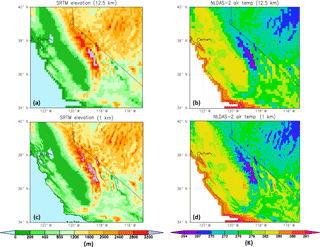 Kumar, S., Peters-Lidard, C., Eastman, J. L., and Tao, W.-K.: An integrated high resolution hydrometeorological modelling testbed using LIS and WRF, Environ. Model. Softw., 23, 169–181, 2008a. Kumar, S., Peters-Lidard, C., Tian, Y., Reichle, R. H., Alonge, C., Geiger, J., Eylander, J., and Houser, P.: An integrated hydrologic modelling and data assimilation framework enabled by the Land Information System (LIS), IEEE Comput., 41, 52–59, https://doi.org/10.1109/MC.2008.511, 2008b. Kumar, S., Reichle, R., Peters-Lidard, C., Koster, R., Zhan, X., Crow, W., Eylander, J., and Houser, P.: A land surface data assimilation framework using the Land Information System: Description and Applications, Adv. Water Resour., 31, 1419–1432, https://doi.org/10.1016/j.advwatres.2008.01.013, 2008c. Kumar, S. V., Peters-Lidard, C. D., Santanello, J., Harrison, K., Liu, Y., and Shaw, M.: Land surface Verification Toolkit (LVT) – a generalized framework for land surface model evaluation, Geosci. Model Dev., 5, 869–886, https://doi.org/10.5194/gmd-5-869-2012, 2012. Kumar, S. V., Peters-Lidard, C. D., Mocko, D., and Tian, Y.: Multiscale Evaluation of the Improvements in Surface Snow Simulation through Terrain Adjustments to Radiation, J. Hydrometeor., 14, 220–232, https://doi.org/10.1175/JHM-D-12-046.1, 2013. Kumar, S. V., Peters-Lidard, C. D., Santanello, J. A., Reichle, R. H., Draper, C. S., Koster, R. D., Nearing, G., and Jasinski, M. F.: Evaluating the utility of satellite soil moisture retrievals over irrigated areas and the ability of land data assimilation methods to correct for unmodeled processes, Hydrol. Earth Syst. Sci., 19, 4463–4478, https://doi.org/10.5194/hess-19-4463-2015, 2015. Kumar, S. V., Zaitchik, B. F., Peters-Lidard, C. D., Rodell, M., Reichle, R., Li, B., Jasinski, M., Mocko, D., Getirana, A., De Lannoy, G., Cosh, M. H., Hain, C. R., Anderson, M., Arsenault, K. R., Xia, Y., and Ek, M.: Assimilation of Gridded GRACE Terrestrial Water Storage Estimates in the North American Land Data Assimilation System, J. Hydrometeorol., 17, 1951–1972, https://doi.org/10.1175/JHM-D-15-0157.1, 2016. Lehner, B., Verdin, K., and Jarvis, A.: New global hydrography derived from spaceborne elevation data. Eos, Transactions, AGU, 89, 93–94, 2008. Leung, R. L. and Ghan, S. J.: A subgrid parameterization of orographic precipitation, Theor. Appl. Climatol., 52, 95–118, 1995. Li, L., Gaiser, P. W., Gao, B.-C., Bevilacqua, R. M., Jackson, T. J., Njoku, E. G., Rudiger, C., Calvet, J.-C., and Bindlish, R.: WindSat Global Soil Moisture Retrieval and Validation, IEEE T. Geosci. Remote Sens., 48, 2224–2241, https://doi.org/10.1109/TGRS.2009.2037749, 2010. Liang, X., Lettenmaier, D. P., Wood, E. F., and Burges, S. J.: A simple hydrologically based model of land surface water and energy fluxes for general circulation models, J. Geophys. Res., 99, 14415–14428, https://doi.org/10.1029/94JD00483, 1994. Liu, J., Zhan, X., Hain, C., Yin, J., Fang, L., Li, Z., and Zhao, L.: ”NOAA Soil Moisture Operational Product System (SMOPS) and its validations,” 2016 IEEE International Geoscience and Remote Sensing Symposium (IGARSS), Beijing, 3477–3480, https://doi.org/10.1109/IGARSS.2016.7729899, 2016. Manabe, S.: Climate and the ocean circulation, Mon. Weather Rev., 97, 739–774, 1969. Maraun, D., Wetterhall, F., Ireson, A. M., Chandler, R. E., Kendon, E. J., Widmann, M., Brienen, S., Rust, H. W., Sauter, T., ThemeBl, M., Venema, V. K., Chun, K. P., Goodess, C. M., Jones, R. G., Onof, C., Vrac, M., and Thiele-Eich, I.: Precipitation downscaling under climate change: Recent developments to bridge the gap between dynamical models and the end user, Rev. Geophys., 48, RG3003, https://doi.org/10.1029/2009RG000314, 2010. Masson, V., Champeaux, J., Chauvin, F., Meriguet, C., and Lacaze, R.: A Global Database of Land Surface Parameters at 1-km Resolution in Meteorological and Climate Models, J. Climate, 16, 1261–1282, https://doi.org/10.1175/1520-0442(2003)16<1261:AGDOLS>2.0.CO;2, 2003. McNally, A., Arsenault, K., Kumar, S. Shukla, S., Peterson, P., Wang, S., Funk, C., Peters-Lidard, C. D., and Verdin, J. P.: A land data assimilation system for sub-Saharan Africa food and water security applications, Sci. Data, 4, 170012, https://doi.org/10.1038/sdata.2017.12, 2017. Miller, D. A. and White, R. A.: A conterminous United States multilayer soil characteristics dataset for regional climate and hydrology modelling, Earth Interact., 2, doi:https://doi.org/10.1175/1087-3562(1998)002<0001:ACUSMS>2.3.CO;2, 1998. Mitchell, K. E., Lohmann, D., Houser, P. R., Wood, E. F., Schaake, J. C., Robock, A., Cosgrove, B. A., Sheffield, J., Duan, Q., Luo, L., Higgins, R. W., Pinker, R. T., Tarpley, J. D., Lettenmaier, D. P., Marshall, C. H., Entin, J. K., Pan, M., Shi, W., Koren, V., Meng, J., Ramsay, B. H., and Bailey, A. A.: The multi-institution North American Land Data Assimilation System (NLDAS): Utilizing multiple GCIP products and partners in a continental distributed hydrological modelling system, J. Geophys. Res., 109, D07S90, https://doi.org/10.1029/2003JD003823, 2004. Monfreda, C., Ramankutty, N., and Foley, J. A.: Farming the planet: 2. Geographic distribution of crop areas, yields, physiological types, and net primary production in the year 2000, Global Biogeochem. Cy., 22, GB1022, https://doi.org/10.1029/2007GB002947, 2008. Nearing, G. S., Mocko, D. M., Peters-Lidard, C. D., Kumar, S. V., and Xia, Y.: Benchmarking NLDAS-2 Soil Moisture and Evapotranspiration to Separate Uncertainty Contributions, J. Hydrometeor., 17, 745–759, https://doi.org/10.1175/JHM-D-15-0063.1, 2016. Newman, A. J., Clark, M. P., Winstral, A., Marks, D., and Seyfried, M.: The use of similarity concepts to represent subgrid variability in Land Surface Models: Case study in a snowmelt-dominated watershed, J. Hydrometeor., 15, 1717–1738, https://doi.org/10.1175/JHM-D-13-038.1, 2014. Nijssen, B., Schnur, R., and Lettenmaier, D. P.: Global Retrospective Estimation of Soil Moisture Using the Variable Infiltration Capacity Land Surface Model, 1980–93, J. Climate, 14, 1790–1808, https://doi.org/10.1175/1520-0442(2001)014<1790:GREOSM>2.0.CO;2, 2001. Oleson, K. W., Lawrence, D. M., Bonan, G. B., Flanner, M. G., Kluzek, E., Lawrence, P. J., Levis, S., Swenson, S. C., and Thornton P. E.: Technical Description of version 4.0 of the Community Land Model (CLM), NCAR/TN-478+STR, National Center for Atmospheric Research, Boulder, 2010. 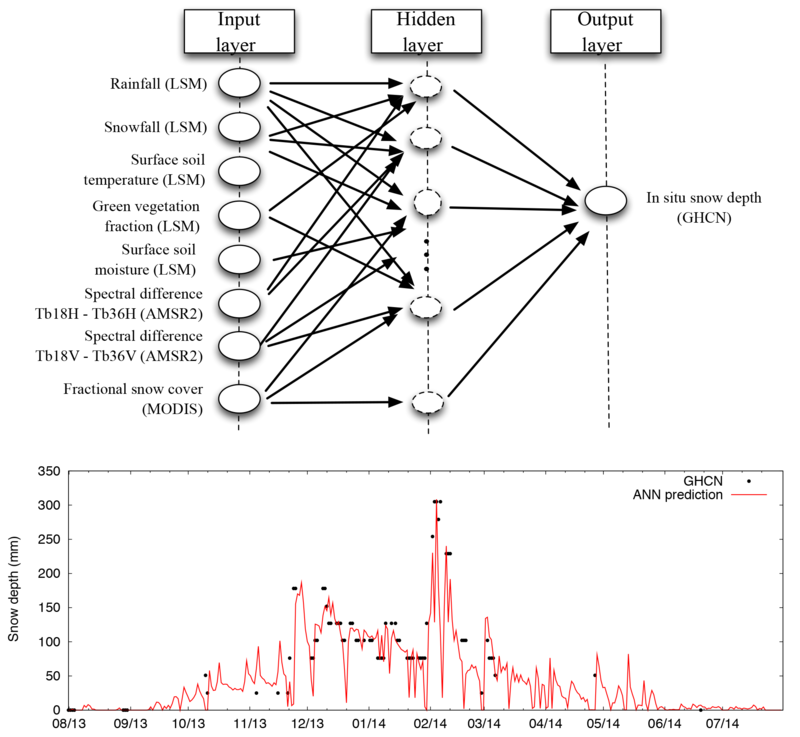 Ozdogan, M. and Gutman, G.: A new methodology to map irrigated areas using multi-temporal MODIS and ancillary data: An application example in the continental U.S., Remote Sens. Environ., 112, 3520–3537, 2008. Ozdogan, M., Rodell, M., Beaudoing, H. K., and Toll, D.: Simulating the effects of irrigation over the United States in a Land Surface Model based on satellite-derived agricultural data., J. Hydrometeorol., 11, 171–184, https://doi.org/10.1175/2009JHM1116.1, 2010. Peters-Lidard, C. D., Houser, P. R., Tian, Y., Kumar, S. V., Geiger, J., Olden, S., Lighty, L., Doty, B., Dirmeyer, P., Adams, J., Mitchell, K., Wood, E. F., and Sheffield, J.: High-performance Earth system modeling with NASA/GSFC's Land Information System, Innov. Syst. Softw. Eng., 3, 157–165, https://doi.org/10.1007/s11334-007-0028-x, 2007. Rasmussen, R., Liu, C., Ikeda, K., Gochis, D., Yates, D., Chen, F., Tewari, M., Barlage, M., Dudhia, J., Yu, W., Miller, K., Grubisic, V., Thompson, G., and Gutmann, E.: High-resolution coupled climate runoff simulations of seasonal snowfall over Colorado: a process study of current and warmer climate, J. Climate, 24, 3015–3048, 2011. Raupach, M., Rayner, P., Barrett, D., DeFries, R., Heimann, M., Ojima, D., Quegan, S., and Schmullius, C.: Model-data synthesis in terrestrial carbon observation: methods, data requirements and data uncertainty specifications, Global Change Biol., 11, 378–397, 2005. Reichle, R. H. and Koster, R. D.: Bias reduction in short records of satellite soil moisture, Geophys. Res. Lett., 31, L19501, https://doi.org/10.1029/2004GL020938, 2004. Reichle, R. H., McLaughlin, D. B., and Entekhabi, D.: Hydrologic data assimilation with the ensemble Kalman filter, Mon. Weather Rev., 130, 103–114, 2002. Reichle, R. H., Koster, R. D., De Lannoy, G. J., Forman, B. A., Liu, Q., Mahanama, S. P., and Touré, A.: Assessment and Enhancement of MERRA Land Surface Hydrology Estimates, J. Climate, 24, 6322–6338, https://doi.org/10.1175/JCLI-D-10-05033.1, 2011. Reynolds, C. A., Jackson, T. J., and Rawls, W. J.: Estimating soil water-holding capacities by linking the Food and Agriculture Organization Soil map of the world with global pedon databases and continuous pedotransfer functions, Water Resour. Res., 36, 3653–3662, https://doi.org/10.1029/2000WR900130, 2000. Rodell, M., Houser, P. R., Jambor, U., Gottschalck, J., Mitchell, K., Meng, C-J., Arsenault, K., Cosgrove, B., Radakovich, J., Bosilovich, M., Entin, J. K., Walker, J. P., Lohmann, D., and Toll, D.: The Global Land Data Assimilation System, Bull. Am. Meteorol. Soc., 85, 381–394, 2004. Rodell, M., Houser, P., Berg, A., and Famiglietti, J.: Evaluation of 10 Methods for Initializing a Land Surface Model, J. Hydrometeor., 6, 146–155, https://doi.org/10.1175/JHM414.1, 2005. Ryo, M., Saavedra Valeriano, O. C., Kanae, S., and Ngoc, T. D.: Temporal Downscaling of Daily Gauged Precipitation by Application of a Satellite Product for Flood Simulation in a Poorly Gauged Basin and Its Evaluation with Multiple Regression Analysis, J. Hydrometeor., 15, 563–580, https://doi.org/10.1175/JHM-D-13-052.1, 2014. Salmon, J. M., Friedl, M. A., Frolking, S., Wisser, D., and Douglas, E. M.: Global rain-fed, irrigated, and paddy croplands: A new high resolution map derived from remote sensing, crop inventories and climate data, Int. J. Appl. Earth Observ. Geoinform., 38, 321–334, 2015. Sampson, K. and Gochis, D.: WRF Hydro GIS Pre-Processing Tools, version 2.2, National Center for Atmospheric Research, Boulder, CO, Reference site, available at: https://www.ral.ucar.edu/sites/default/files/public/projects/wrf_hydro/v3_0/Standalone_Tool_v2_2.zip (last access: 25 July 2018), 2015. Save, H., Bettadpur, S., and Tapley, B. D.: High resolution CSR GRACE RL05 mascons, J. Geophys. Res.-Solid Earth, 121, 7547–7569, https://doi.org/10.1002/2016JB013007, 2016. Sellers, P. J., Randall, D. A., Collatz, G. J., Berry, J. A., Field, C. B., Dazlich, D. A., Zhang, C., Collelo, G. D., and Bounoua, L.: A revised land surface parameterization (SiB2) for Atmospheric GCMs, Part I: Model formulation, J. Climate, 9, 676–704, 1996. Sen Gupta, A. and Tarboton, D. G.: A tool for downscaling weather data from large-grid reanalysis products to finer spatial scales for distributed hydrological applications, Environ. Modell. Softw., 84, 50–69, https://doi.org/10.1016/j.envsoft.2016.06.014, 2016. Skamarock, W. C., Klemp, J. B., Dudhia, J., Gill, D. O., Barker, D. M., Duda, M. G., Huang, X.-Y., Wang, W., and Powers, J. G.: A description of the advanced research WRF Version 3. Tech. Rep. TN-475, National Center for Atmospheric Research, 2008. Smirnova, T. G., Brown, J. M., Benjamin, S. G., and Kenyon, J. S.: Modifications to the Rapid Update Cycle Land Surface Model (RUC LSM) Available in the Weather Research and Forecasting (WRF) Model, Mon. Weather Rev., 144, 1851–1865, https://doi.org/10.1175/MWR-D-15-0198.1, 2016. Sun, W.-Y. and Bosilovich, M. G.: Planetary boundary layer and surface layer sensitivity to land surface parameters, Bound.-Layer Meteorol., 77, 353–378, https://doi.org/10.1007/BF00123532, 1996. Tapley, B., Bettadpur, S., Watkins, M., and Reigber, C.: The Gravity Recovery and Climate Experiment: Mission overview and early results, Geophys, Res. Lett., 31, L09607, https://doi.org/10.1029/2004GL019920, 2004. The HDF Group: Hierarchical data format version 5, available at: http://www.hdfgroup.org/HDF5 (last access: 25 July 2018), 2015. Unidata: Network Command Data Form (NetCDF), version 4.3.3.1[software]. Boulder, CO: UCAR/Unidata Program Center, available at: http://www.unidata.ucar.edu/blogs/news/entry/netcdf_4_3_3_1 (last access: 25 July 2018), 2015. USGS: Global Land Cover Characterization (GLCC) Version 2 Dataset, available at: https://lta.cr.usgs.gov/GLCC, last access: 30 January 2018. 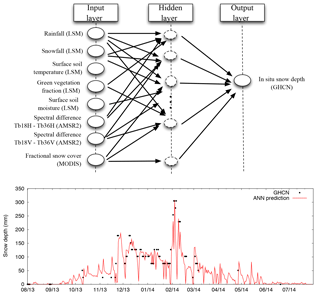 Verdin, J. and Klaver, R.: Gridcell-based Crop Water Accounting for the Famine Early Warning System, Hydrol. Process., 16, 1617–1630, https://doi.org/10.1002/hyp.1025, 2002. Wentz, F. J., Meissner, T., Gentemann, C., Hilburn, K. A., and Scott, J.: Remote Sensing Systems GCOM-W1 AMSR2 Daily Environmental Suite on 0.25 deg grid, Version V.2. Remote Sensing Systems, Santa Rosa, CA, 2014. Williams, M., Richardson, A. D., Reichstein, M., Stoy, P. C., Peylin, P., Verbeeck, H., Carvalhais, N., Jun, M., Hollinger, D. Y., Kattge, J., Leuning, R., Luo, Y., Tomelleri, E., Trudinger, C. M., and Wang, Y.-P.: Improving land surface models with FLUXNET data, Biogeosci., 6, 1341–1359, 2009. Xia, Y., Youlong, X., Mitchell, K., Ek, M., Sheffield, J., Cosgrove, B., Wood, E., Luo, L., Alonge, C., Wei, H., Meng, J., Livneh, B., Lettenmaier, D., Koren, V., Duan, Q., Mo, K., Fan, Y., and Mocko, D.: Continental-scale water and energy flux analysis and validation for the North American Land Data Assimilation System project phase 2 (NLDAS-2): 1. Intercomparison and application of model products, J. Geophys. Res., 117, D03109, https://doi.org/10.1029/2011JD016048, 2012. Zalasiewicz, J., Williams, M., Haywood, A., and Ellis, M.: The Anthropocene: a new epoch of geological time?, Phil. Trans. R. Soc. A, 369, 835–841, https://doi.org/10.1098/rsta.2010.0339, 2011.